Latin Trails, a family-run company with deep roots in Ecuador and the Galapagos Islands, operates two ships in the Galapagos, including the 16-passenger, first-class motor catamaran Galapagos Seaman Journey. 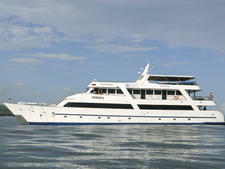 (The line's second ship is the luxury yacht Galapagos Sea Star Journey.) Both ships offer incredible access to the Galapagos Islands and a laid-back, authentic experience that's hard to replicate on larger vessels. Seaman Journey is an ultra-stable, twin-hulled yacht that launched in 2008 and has been meticulously cared for and maintained since that time. It was last refurbished in 2015, with its next dry dock scheduled for December 2017. All excursions are included in the cruise fare, and that means plenty of tours on the catamaran's two Zodiacs as well as snorkeling and kayaking expeditions in Galapagos National Park. (The catamaran carries four two-person sea kayaks.) The onboard naturalist also leads plenty of hikes ashore. The decor is what Latin Trails calls "modern marine," with light tones, white linens and colorful appliances that add a pop of color throughout the ship. M/C Galapagos Seaman Journey offers three main itineraries that range from four to seven nights, and can be combined for a longer voyage of up to 14 nights. Your visit may include visits to the San Cristobal Interpretation Center and the Charles Darwin Research Center and to the islands of Espanola, Isabela, Fernandina, Floreana, Santa Fe, South Plaza, North Seymour, Santa Cruz, Sombrero Chino, Genovesa, Bartolome, Santiago and Mosquera. The cruise fare includes transfers from Galapagos airports, all excursions and unlimited water, tea and coffee. You'll pay extra for wine, cocktails and soda. Gratuities are not included. Factor in $10 per person per day for the guide and $25 to $30 per person per day for the rest of the crew combined.